The term ‘Lumbar Support’ appears frequently in discussions about kayak fishing and paddling related back pain. The underlying assumption in those discussions is that the lumbar area of your back (lumbar spine) requires adequate support, and if such support is provided your back pain will disappear, or at least become tolerable. As you can see, the lumbar spine consists of rigid vertebrae and more flexible cartilage between them. 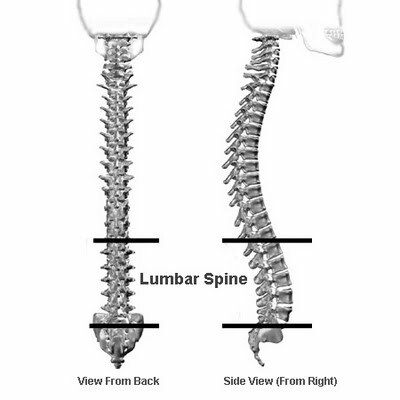 This part of the spine supports the combined weight of the upper part of the body, including the torso, head and arms, and it is normally supported by the massive structure of the hip bones below. In other words, in its natural state, there is nothing that pushes, holds, or supports the lumbar spine from any direction except from its top and bottom, and what holds it in this normal position are the muscles around it. How Did the Lumbar Spine Become a Problem for Kayak Fishermen and Paddlers? The native people of the arctic, who originally created the first kayaks were used to sit down on the floor with their legs stretched forward, and therefore didn’t have any use for additional support for their lumbar spine. This is why native kayaks did not feature a backrest, or any other ‘lumbar support’. When Westerners began paddling those aboriginal kayaks they noticed they had problems staying upright with their legs stretched forward, in the posture known as the L position. This is because they were not used to sitting in this position in everyday life, and the muscles in their body weren’t adjusted to it. Rather than adjusting the paddler to the kayak, designers and manufacturers decided it would be easier to try and adapt the kayak to the paddler, and introduced a combination of backrest and footrests designed to lock the kayakers in the L position, and prevent their upper body from ‘falling’ backward or sliding forward (‘slouching’). The kayak paddler, or fisherman is effectively ‘supported’ by three rigid points anchored in the kayak: two footrests and one back rest. By continuously pushing against those three points, the kayak fisherman’s legs provide the power necessary to maintain his body in its place, and in the required posture. How Does the L Posture Affect the Lumbar Spine? Your legs have the most powerful set of muscles in your body, capable of making you run, jump and kick. When you’re locked in the L position, your legs are constantly pushing against the kayak’s footrests, as well as against your lumbar spine, which is ‘supported’ by the backrest behind it. This strong, continuous pressure on your lumbar spine comes from an unnatural angle, that is from the backrest behind it. There is no way for you to stop it or relieve it as long as you’re in this position, which is the only one that sit-in and sit-on-top (SOT) kayaks are designed to offer. Effectively, when you’re paddling such kayak or fishing from it, the only way for you to relieve the pressure is to get out of the kayak, stand up and stretch, walk, etc. How Does it Lead to Pain, and to the ‘Yak Back’ Syndrome? Getting out of the kayak in order to relieve the pressure on your lower back is not a realistic option in most cases, and this is why most kayak fishermen and paddlers keep sitting in their kayaks although they feel a growing discomfort, and eventually pain in their backs. This pain is known as ‘Yak Back’, and most people who paddle sit-in and SOT kayaks for periods longer than an hour experience it sooner or later, to some extent. The pain is the result of the abnormal pressure on the cartilage rings, and the contraction of the the muscles in this area as a result of the effort they have to make in order to prevent back (spine) injuries, or at least minimize them. Try to imagine the fight between the extremely powerful legs pushing your lumbar spine against the backrest behind you, and the much less powerful muscles in your lower back that are trying to protect your spine, and prevent it from being damaged. Luckily for you, your lower back would soon enough start to ‘scream’ that it’s being hurt, or in other words – you’re going to feel pain. This pain should tell you to stop this unhealthy struggle between your legs and your back, before your back gets seriously injured. Ignoring the pain at any given moment would result in the aggravation of the problem, that is to more pain, and eventually to a more severe back injury that would take you a longer time to recover from. How much pressure do your legs exert on your lower back (lumbar spine) in the L position? We’ve measured 40 to 60 lbs in adults. You can try and measure the pressure yourself, using a bathroom scale positioned vertically between your lower back and your kayak backrest: Have someone stand behind you and read the dial for you. It’s bad news for your lower back, considering the pressure is constant, and you can’t avoid it. It’s even worse news considering the fact that effectively, this pressure is applied on a few lumbar vertebrae and cartilage discs that are badly positioned to resist it in such angle. In terms of lbs per square inch, these pressure figures would be impressive, as well as most alarming. Kayaking and kayak fishing instructors would tell you to sit straight in order to improve your kayaking technique and perform the required rotational movements of the torso in a more efficient manner. However, you need to remember that the people who initially invented and perfected this technique or paddling styles never used a backrest in their kayaks, because they didn’t need to. Consequently, they didn’t suffer from ‘Yak Back’ – unlike you. This is to say that perfecting your kayaking technique would not improve your lower back’s situation in any way: You will keep feeling discomfort and pain, and you’ll keep being at risk of back injuries, and even chronic damage. The obvious reason for this is the fact that your legs will keep pushing your lumbar spine against your kayak’s backrest. Sit-in and SOT kayak vendors would offer you to ‘upgrade’ to the latest ‘ergonomic’ seat, that’s bound to more more expensive than the last one you bought. They would praise the extra cushioning offered to your hips and lower back, and claim that such seats would get rid of your fatigue, back pain and leg numbness – once and for all. The reality is quite different: Special kayak seats have been around for decades, and none of them has produced the desired effect of ending the Yak Back, simply because all seats have a backrest by definition, and no amount of cushioning can reduce the total amount of force that your legs use when they push that backrest against your lumbar spine. On the contrary: The extra soft cushioning may reduce the point pressure on softer tissues in your lower back (E.G. skin), and by that somehow delay the sensation of discomfort and eventually pain in your lumbar spine and in the muscles that support it. In other words, you’ll start feeling the problem when it’s already at a more advanced stage, which is not necessarily a good thing for you, if you think about it from your a health perspective. In recent years, manufacturers of fishing kayaks have attempted to address the back pain problem by offering bigger and wider kayaks a.k.a. ‘barges‘ outfitted with higher seats. Their rationale was “We’d better allow the user to sit higher, and we’ll compensate them for the lost stability by making their kayak wider and thus stabler”. But does this approach work? – Not really, since due to their mono-hull, elliptical form, increasing the width of sit-on-top (SOT) or sit-in kayaks (SIK) has a rather limited effect on itheir stability. Therefore, their users (especially if they’re heavy people) must compensate for some of the lost stability by working harder with their legs, which in this case of SOTs and SIKs results in them applying more horizontal pressure on their lower back, which leads to discomfort, pain, and in some cases even injuries. Obviously, you need to avoid paddling and fishing in the L position, because it’s not merely uncomfortable, but in fact potentially harmful to your lower back, and sitting in it regularly for prolonged periods of time could lead to back injuries and chronic back pain. Having said that, what would be the ideal fishing kayak for you? -One that would offer you comfort at all times, and the ability to take care of your sore back. In fact, such kayak does exist. It’s the patented Wavewalk™ kayak, and by patent we mean a patent for an invention (utility patent), and not just a design patent. To begin with, W fishing kayaks feature no backrest whatsoever – similarly to all-terrain vehicles (ATV), snowmobiles, off-road motorbikes, and jet-skis. What all of those have in common is the fact that when you ride them it’s your own legs that support your upper body. This is good news for your lumbar spine, since it’s basically a posture equivalent to walking, or running – since no unnatural pressure points are being created. Second, the saddle type seat that W fishing kayaks feature offers a variety of positions, including standing up, plus the ability to change between any two positions at any given moment. Thus, whatever discomfort felt in your back, or local pressure building up in any part of your body can be effectively relieved as soon as you feel it. As a result, even paddlers and fishermen suffering from chronic and acute back problems report spending long hours in their W kayaks without feeling discomfort or pain. You can find such testimonials in a number of fishing kayak reviews, where they say that without their W kayak paddling or fishing from kayaks would be impossible for them – because of their back condition.